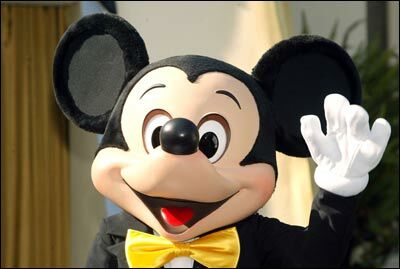 Rediff.com » Business » Mickey Mouse to lead Disney's double delight! Mickey Mouse to lead Disney's double delight! Mickey Mouse has come to India with the entire Walt Disney family! Walt Disney will launch two 24-hour channels from December 17 in India. The two channels, Disney Channel and Toon Disney, from one of the world's largest media groups, will offer entertainment to kids and families in India. The STAR group will distribute both the channels. Announcing the launch on Wednesday, Rajat Jain, Managing Director, Walt Disney Television International (India), said, "This is a historic moment for Walt Disney. India is a priority market for Walt Disney and we hope to capture the hearts of millions in the country with localised content and high quality programs." Toon Disney will be India's only 24-hour Tamil and Telugu kids' channel and Disney Channel will be a 24-hour Hindi channel. However, both channels will have English feeds 'in appropriate places'. "India has a large presence of kids with 11 per cent of the population under the age of 4. We also hope to cater to this segment with pre-schooling programmes. We plan to redefine the family entertainment with kids as the entry points," Jain added. While Disney Channel will cater to kids and families with animated movies, sitcoms, family dramas, live action, adventure stories, Toon Disney will have the world's best loved cartoons like Mickey Mouse and Donald Duck. Disney Channel will air 60 celebrated movies a month. The fare will include mega hits like Lion King, Tarzan, Beauty and the Beast, etc. "The channels are aimed at kid empowerment, creative learning with interactive programmes and positive programmes with good morals as we have discovered that 90 per cent of the children do not watch kids' channels in India," Hema Govindan, head, marketing, Walt Disney Television International (India), said. With 3,000 hours of multi-genre content, of which 400 hours of programming have been made fully in India, this move is bound to provide a great fillip to the Indian animation industry, said Disney officials. Disney Channel will debut with an Indian tale -- How the nightingale became the king -- from the famous Legends of the Rings of Fire, fully developed in India. Both the channels with a blend of Disney and localised content with Indian music will create real magic, Hema Govindan added. "It is a very good time to enter the Indian market. It doesn't matter that we are a late entrant, what matters is how long we are able to sustain it. Walt Disney has been in India for a decade and we hope to consolidate our position further in India," Jain said.